The definitive overview of how agencies work with the White House and OMB. A definitive overview of how the White House, the Cabinet, federal agencies and OMB interact with each other, Congress, the media, and the public. This session will provide an overview of the structure of the Executive Office of the President, the Cabinet, and the relationship between the president and the executive branch as a whole, and how it has changed and expanded over time. The instructor will address the ability of the president to lead or manage the executive branch bureaucracy and comment on the relations between political appointees and career civil servants. What is the president's role in the legislative process? How did this role evolve? How does the president set his legislative agenda in Congress today? The instructor will examine the characteristics that determine a president's "success" in passing his legislative agenda. He will review how the balance of power between the executive and legislative branches has shifted over time, and how the relationship between the two branches differs depending on whether there is unified or divided party control. This session will briefly describe the goals and purposes of legislative oversight and how our constitutional scheme of separated but shared powers impacts on these goals and purposes. The unique and vital role of investigations will be distinguished from other leading methods of the oversight process. This will be followed by a brief review of the legal basis for investigative oversight, a description of the essential tools available to committees to make it effective, a discussion of the problems that may arise in enforcing the investigative prerogative, and actions that may be taken to circumvent such problems. Each topic will be illustrated by prominent historical examples of inter-branch confrontations. This session will address the communication strategies used by the president to convey his messages to the public. The roles of the White House Office of Communication and Press Office will be examined. The instructor will discuss the executive's use of press conferences and press releases and comment on the use of news leaks (strategic, trial balloons, and unauthorized). This session will describe the elements of the President's Management Agenda, reviewing each of the components--strategic human capital, financial management, e-government, competitive sourcing, and budget and performance integration. The standards for success will be reviewed. The current status of federal agencies will be described, and the key factors for improved performance will be reviewed. The instructor will orient the attendees to the organization and responsibilities of a White House legislative affairs team, including how it is organized at the beginning of a president's term, and how it fits into the structure of the White House as a whole. The instructor will provide an inside look at how the White House Office of Legislative Affairs does its work on Capitol Hill, the key players involved, their access to the president, and how decisions are made. The instructor will trace the history and evolution of the differing roles and functions of the offices of Inspectors General and the Government Accountability Office and the executive's response to them. Particular attention will be paid to how the 2003 District Court ruling in Walker v. Cheney effects the GAO's continued ability to effectively perform oversight support functions for Congress. Federal agencies are prohibited from lobbying, but all federal agencies have created congressional liaison offices to build working relationships with Congress, both committees of jurisdiction and personal offices of members. In this session, a representative from an executive agency will discuss the organization and responsibilities of his agency's legislative affairs team, how a legislative affairs shop can educate and work most effectively with Capitol Hill, and lobbying restrictions of which to be aware. A sample agenda is available as a PDF. See our Sample Agendas page for agendas from our other custom training. Audience Level All agency staff who must deal with Congress or OMB will benefit from this training. Basic understanding of administrative agencies and the legislative process or Understanding the Regulatory Process and Congressional Dynamics and the Legislative Process recommended. Audience Size This program is most effective for between 25 and 40 attendees. Course Materials Workshop materials include personal copies of the Training Edition Congressional Deskbook. Usually requires 2 to 4 days. Payment Payment methods we accept for custom training include checks, and EFT/ACH. 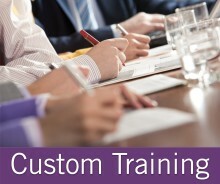 If you don't have enough staff for a custom, on-site training program, you can still train your staff with our audio courses. A group of more than 5 experts, each with at least 10 years' experience in observing or working with or in the White House or OMB, teach this intensive 2-day conference.